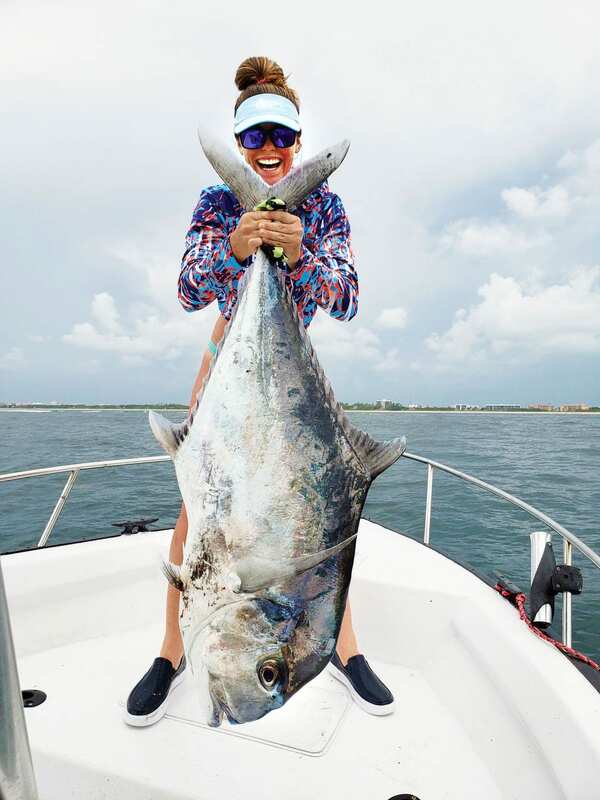 On June 9th, 2018, Victoria Watts of Titusville, Florida was lucky enough to land record African pompano. This once in lifetime fish will set the IGFA women's record on 20lb line class. It indeed was a monster and impressive to land it. I am sure by now you are wondering how this record fish was caught? Watts and her captain were fishing with live bait in about 300 feet of water off the Boca Raton inlet. Drifting blue runners and goggle eyes off the bottom are how they enticed this large African pompano to bite. They caught the record African pompano late in the day on one of their last drifts. When the fish hit, captain Tyler Baruch, immediately picked up the rod because he figured he would get spooled. The last thing on their minds was the thought of landing a record fish. The fight is one that Watts will remember for a long time. It took about 20 minutes to get this fish up into eyesight. Watts remembered thinking she had hooked a big sea turtle but quickly realized it was a large fish when it emerged from the depths. After realizing it was a giant African pompano, the concern became getting it into the boat. It took both Watts and Baruch to gaff the African pompano and get it over the rail and into the boat. “When we finally got it in, we were going crazy,” said Watts. After landing this record African pompano, they knew they had a big fish. Little did they know it was the potential world record. "This is a once in a lifetime fish," Watts said. They knew they had to get this back to the dock and get it weighed. Turns out this once in a lifetime record African Pompano weighed in at a whopping 45lbs 8 ounces. Although it fell short of the world record African pompano by five pounds, it would still easily set the record for women's 20lb line class. The largest African pompano ever caught was 50-pounds, 8-ounces, caught out of Daytona Beach by Tom Sargent in 1990. The existing women’s 20-pound line class record is 39-pounds, 5-ounces caught by Karen Hogan out of Ft. Pierce, Fla. in 1985. All Watts has to do is submit the paperwork and the record is hers. The world record African pompano is still at large. You could be the next angler to catch a monster African pompano. Get out there and start fishing, you never know when you may land a once in a lifetime fish. If you have any questions, comments or concerns, please feel free to leave us a comment below or email us at info@HFDepot.com. We would love to hear your near record monster fish experiences. We would also love to see all of your African pompano catch so make sure you send us all your great catches to be featured on our social media pages. Try your luck at catching the world-class record fish lurking in the depths.